Clear and crisp the morning; he calls for his mount…they let loose the hounds by a leafy wood…soon some have set off in pursuit of the fox…a young dog yaps, and is yelled at in turn; His fellows fall to sniffing, and follow his lead, running in a rabble on the right track…they discover him soon; and when they see him with sight they pursue him the faster…often he reverses over rough terrain, or loops back to listen in the lee of the hedge; At last, by a ditch, he leaps over the brush…then he thought through his wiles to have thrown off the hounds, till he as ware…of a waiting-station where three athwart his path threatened him at once, all gray… (Abrams et al., 195). This excerpt is from Sir Gawain and the Green Knight that was written by an unknown author in the northwest Midlands between Cheshire and Staffordshire circa 1375-1400 (Abrams et al., 156). Sir Gawain is the original ideal of knighthood in the story of King Arthur and his knights of the Round Table. As the French gained more and more power in Europe, Gawain faded into the background in the legend in order to make room for the famed Lancelot. The tale of Sir Gawain and the Green Knight is a coming of age story of Sir Gawain. Within the text there are many accounts of what royalty did to pass the time. In the house of Lord Bercilak in Sir Gawain and the Green Knight, parties, drinking, and hunting are common forms of entertainment. Hunting was one of the oldest and most enjoyed forms of activity for the highborn. Although it is now mostly considered a sport, there was a time where hunting was a necessity of life. People not only hunted for food, but for fur and skin for clothing, and for bones to be carved. Acquiring knowledge of this pastime marked the aristocrat. Hunting parties of the rich and well to do in early medieval England were also social events not to be missed. Usually the leader of these hunting parties in the age of King Arthur (and for centuries afterward) was the respected male head of the household. Accompanying the lord were his sworn huntsmen who were relied upon to make the hunt successful. A boy did not only grow up and become a huntsman. One had to be taught, trained. Training in this period was by apprenticeship. Boys at the age of seven could then enter an apprenticeship to the master of the hunt. The boy would first begin his career with the dogs, for they were crucial to a successful hunt. The apprentice would sleep in the kennels in order to ensure the hounds’ safety from the elements. He would clean the stalls, and water bowls daily. The straw that served as the dogs’ beds had to be changed every three days. The purpose for spending as much time as the apprentice did with the dogs was to allow him to get to know each hound’s personality, learn his strengths and weaknesses. The apprentice would also take care of minor grooming of the horses, but as he got older, he would become a groom, and another apprentice would braid the horse’s hair (Taggart). Becoming a groom was the marker for learning the finer points of a tracking huntsman. The main duty of the groom was, in the morning before the hunt, to find the game trail or the hoof prints left behind by the stags. From the tracks left behind by the animals, the groom was to determine how long ago they were left, if the animals were running, walking, or if they were already being hunted. He would then report his findings to the master huntsman and to the lord. Training involved the groom being sent out in search of a trail planted earlier by the master with a sleuthhound to guide and train him (Taggart). Eventually the groom would ascend to the position of assistant huntsman. Here, the assistant would shadow the huntsman and complete his training. After becoming a huntsman, he would wear heavy leather leggings to protect his legs from thorns and brambles. In the summer he would wear a green jacket, and a fur one in the winter to help him keep warm. Usually the aim of a summer hunt was for stag, and the winter hunt was in search of wild boar. He also would wear a horn around his neck that he would use to call the hounds (Bise), “With horn to the hills he hastens amain…blew upon their bugles bold blasts three; the dogs began to bay…from the hounds they slip the tether; the echoing horns repeat…” (Abrams et al., 182). The huntsman carried many knightly objects that were primarily used in hunting rather than in war. In the huntsman’s belt he carried a long-sword to kill the game and a dagger to skin it. During the actual hunt he would take three horses (two for relays), and one hand would be gloved and carried a leather thong that he would strike against his boot in order to call the hounds. Because he spent all of his younger years with the dogs, they were at his command. He was able to decide which dogs would be appropriate and most helpful in the hunt because he knew every flaw and ability (Bise). During the hunt it is his job to get the hounds back on the right scent if they have gone astray and, if he sees the stag he take care not to frighten it. He keeps an eye on the dogs and if they begin to tire, goes to them urging them on or feeds them bread from a sack, which hangs from the pommel of his saddle. He is quick to dismount to look for a trail if the stag has lost the hounds on a dust track, in a wheat field where the grass has been bunt or if it has crossed water. Finally, at the mort, it is he who kills the frightened, tired and breathless animal with his sword." (Bise). 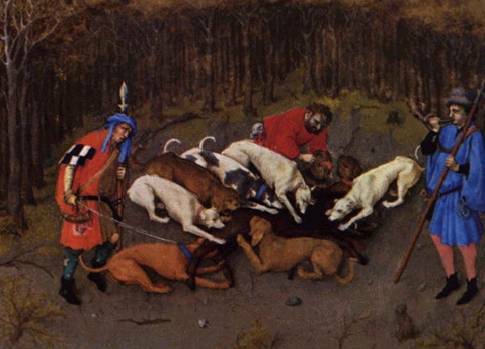 Similar to today’s hunters, it was the rush of the chase and the kill that drove these huntsmen on. However, I believe that it was much more of a sport in the days of Arthur. How much of a chase and thrill of a kill can there be, when only a trigger is pulled by a man wearing neon orange that is perched in a tree?
. New York. W.W. Norton & Company: 2000. Bise, Gabriel. Medieval Hunting Scenes. Miller Graphic, 1979. Taggart, T.M. Training for a Career in the Hunt.